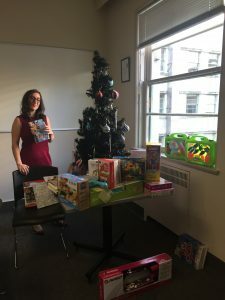 Women's Health Research Institute > In the News > WHRI Annual Toy drive: a gift exchange with a twist! 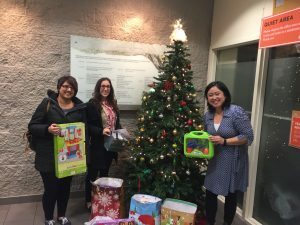 Women's Health Research Institute > Find a Researcher > WHRI Annual Toy drive: a gift exchange with a twist! 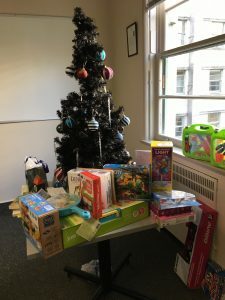 WHRI Annual Toy drive: a gift exchange with a twist! At the WHRI, we have a tradition of doing a holiday gift exchange with a twist. Those who would like to participate are provided with a randomly selected co-worker’s name and asked to buy a gift for that person’s “inner child”. This provides a valuable opportunity to think more deeply about our colleagues, and, thereafter, to donate these specially picked gifts to Crabtree Corner. Crabtree Corner is a unique Downtown Eastside-based organization serving marginalized families, particularly those impacted by maternal substance use. WHRI staff member Nancy posing with one a Wonder Woman action figure. Each year, the team has conscientiously selected a wonderful array of gits, focusing on typically underrepresented groups, such as boys, and older youth. We aim for gifts that encourage physical activity, motor and educational development, and creativity, while we generally avoid toys that promote gender stereotypes. This year we gathered round the table, a fitting homage to Crabtree Corner, where each year countless hot meals are prepared by former clients using produce sourced from a rooftop garden and community donations. As a group, we opened a bevy of beautiful presents, with highlights including a scooter, movie passes, a $50 Old Navy gift-card, explorer and paleontology kits, and much more. Thereafter, the gifts were delivered to the incredible team at Crabtree Corner, where staff hand-matched donations to families. WHRI staff members Nancy and Zahra (aka WHRI Christmas elves) delivering presents to Crabtree Corner. At the WHRI, we are privileged to work alongside inspiring colleagues, to unite as a powerful team, and to belong to an incredible community. This event provides a special opportunity for us to connect and share some of this privilege and thanks with our community. We look forward to this event each year, and hope your holiday will be filled with similar goodwill and cheer! Read more about Crabtree Corner here. Previous Previous post: Dr Lori Brotto named APOG Researcher of the Year!